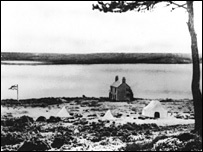 The Dorset island where scouting began is to be the focus of celebrations marking the movement's centenary. Thousands of people are expected to visit Brownsea Island this summer to see where Robert Baden-Powell set up the first camp in August 1907. About 20 boys from different social backgrounds were involved in the camp, which led Baden-Powell to write a book called Scouting for Boys. A commemorative centenary camp will be attended by 300 scouts on 1 August. Scouts around the world will renew their vows at 0800 GMT, the time when the movement was officially born. Building work has begun to transform the original camp site on Brownsea Island into the Baden-Powell Outdoor Activity Centre. Scout Jon Grimes, 19, said their re-enactment of the first camp would be an important moment. "It was about crossing the social divide and making friends," he said. "Our camp this year will be about making friends between people from different cultures and countries with scouts from around the world." 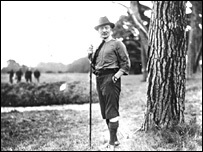 Baden-Powell, who was a Lieutenant General in the British Army in the late 19th Century, taught his men using competitions and games to compliment traditional training. He used local boys in South Africa to help with first aid, run errands and carry messages. When he returned home, he decided boys in the UK would benefit from learning similar skills and set up the first experimental scouts camp on Brownsea Island. The National Trust-owned island is open for visits from 24 March to 28 October.